Next, we have another beautiful watercolor peony. The flower is tattooed on the arm and it features light pink petals and a dark green stem. This is one our favorite tattoos because it is so elegant, it almost looks like a hand-painted work of art. A tattoo like this will look stunning on everyone. Looking for a trendy tattoo design? Then check out this next idea. 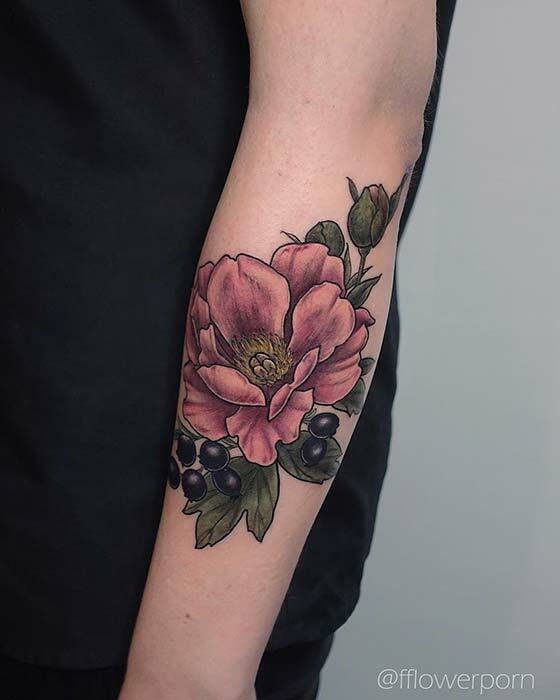 Here we have a peony tattoo that starts on the shoulder and ends on the arm. The design is black ink and it also features small berries too. It is a beautiful, botanical piece and it will give you a stylish look. Recreate this or continue the design all the way down the arm. If you want a cute tattoo then this idea is for you. 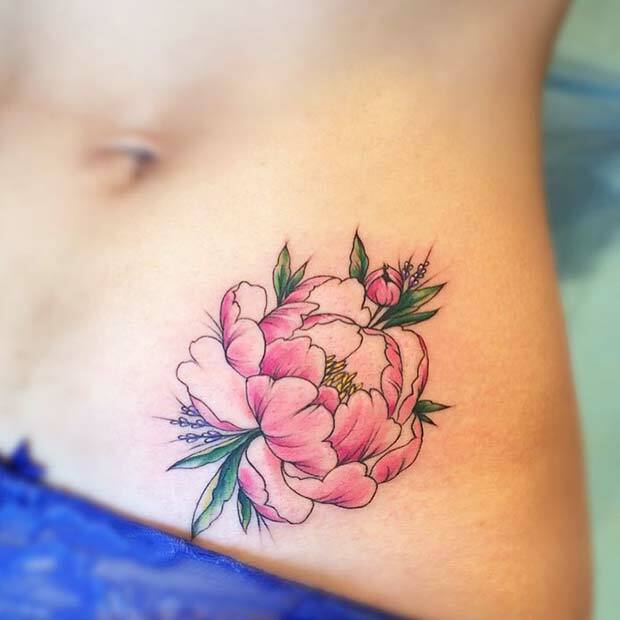 This is a hip tattoo that features a pretty, light pink peony. A tattoo like this is perfect for someone who wants a piece of body art that can easily be covered up if needed. However, you can also show it off when you choose to. We love the color and the design it is beautiful. You could try this peony or have a black ink design for a subtler look. Earlier in the post we featured a watercolor back tattoo. If you loved that design, then you will like this one too. Here we have another watercolor peony but this one is just the head with no stem. The actual flower itself uses a similar color and it has that stunning watercolor effect. It is just a smaller version and a design like this can be tattooed anywhere. The next idea we have to show you combines two of the must-have tattoos. 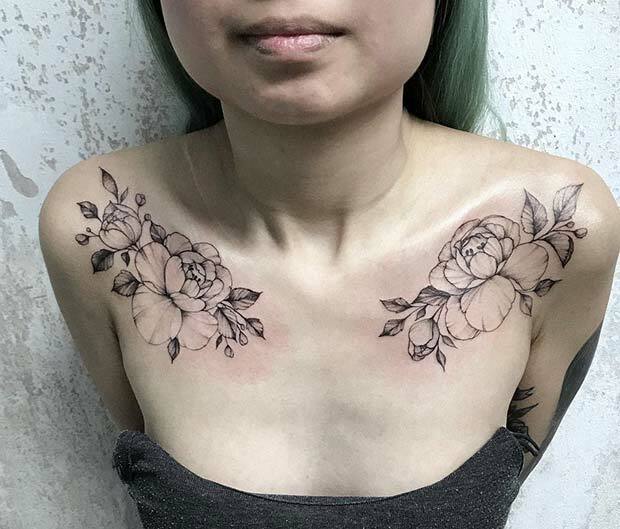 This design features beautiful peonies that have been tattooed on the ribs. With this design, you get the beauty of the flowers combined with the style and edginess of a rib tattoo. 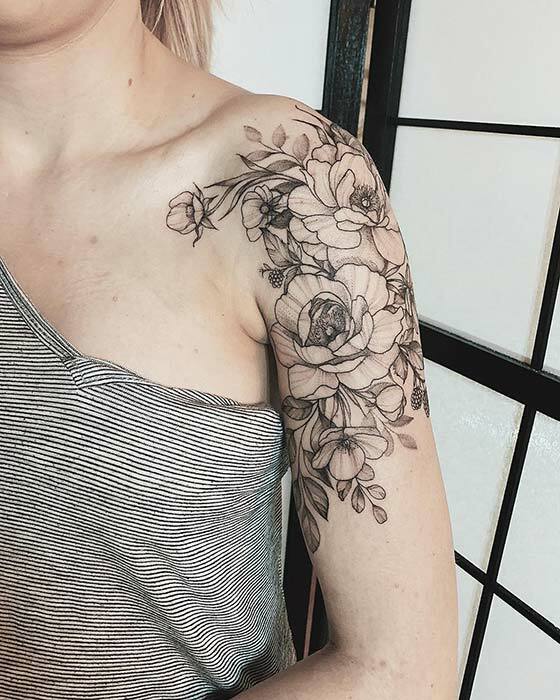 Recreate black ink peonies like this or add some color for a bolder tattoo. 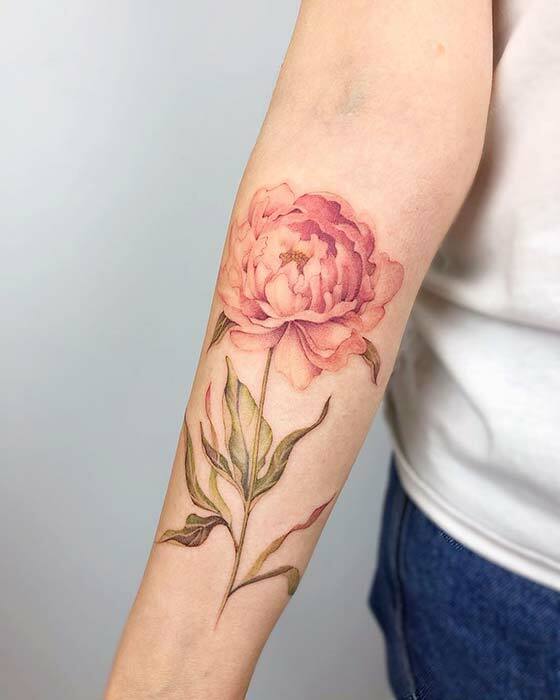 One of the tattoo designs we shared earlier featured peonies that were placed on the shoulder and on the top of the arm. This next design shows you how stylish a similar design can look further down the arm on the forearm. As you can see, it is so trendy and beautiful! A tattoo like this is perfect for the ladies that want a bold piece of body art that can be shown off. This next tattoo idea is another one of our favorites. 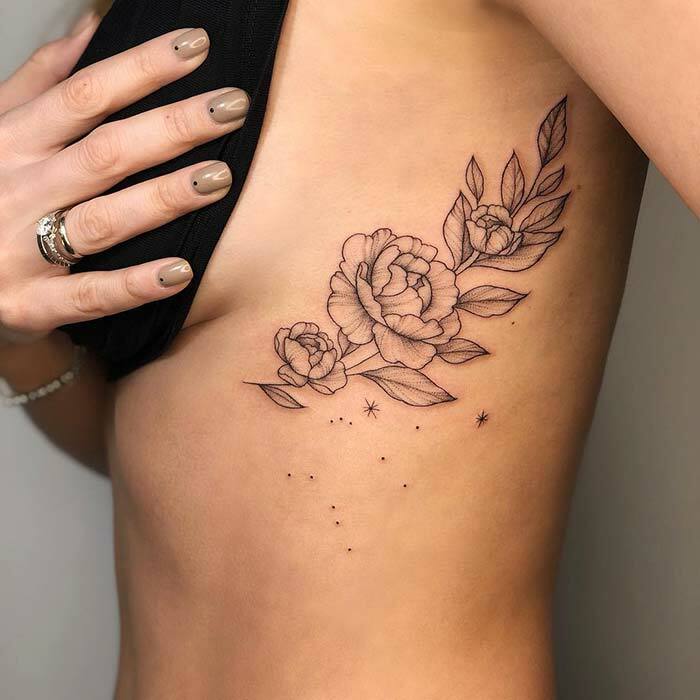 The design features stylish black ink peonies that are tattooed on the chest under the collarbone. There is one tattoo on each side. We love the matching designs and they will give you a trendy and edgy look. Recreate these or you can try adding color. Subtle watercolor will look amazing. Thigh tattoos are another stylish idea that you could consider. This tattoo is a beautiful example. 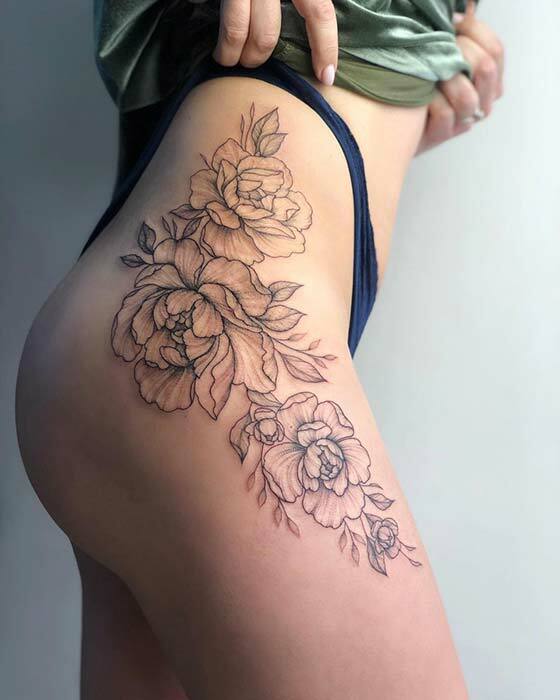 Here we have a thigh tattoo that features a stunning peony design. 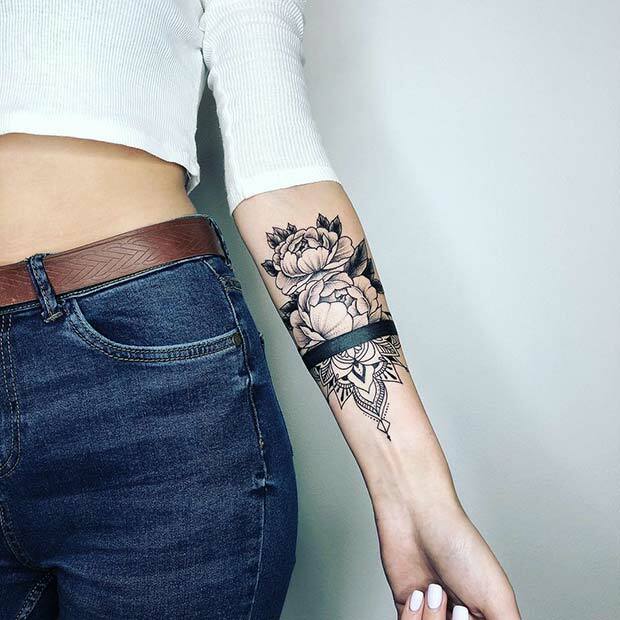 It is just a gorgeous and trendy floral tattoo that will never go out of style. Try a design like this or you can have a smaller version. Looking for a unique tattoo that will make you stand out from the crowd? Then this could be perfect for you. 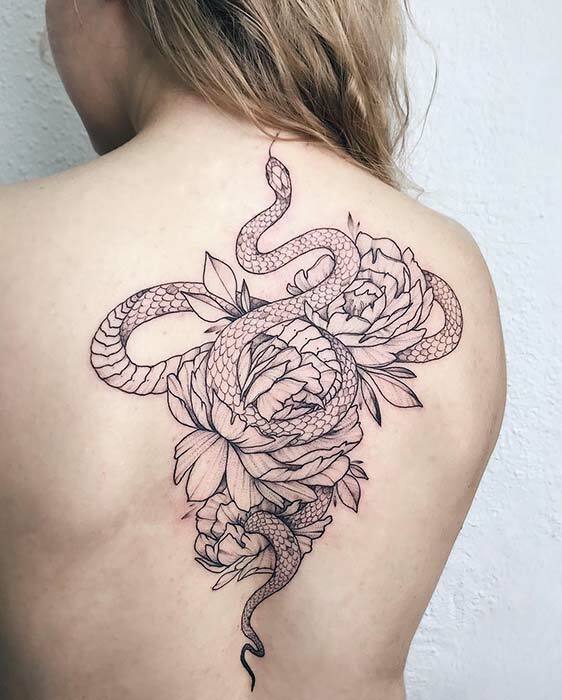 This back tattoo features lots of peonies with a snake weaving in-between them. It is a trendy tattoo and snakes also symbolize different things including rebirth and transformation, so the design has a positive message too. Recreate this or add color for a vibrant piece of body art. Next, we have another botanical tattoo to show you. This one features a stunning pink peony with black berries too. It is such a stylish combination and it is perfect for anyone who loves nature and plants. A design like this can be placed anywhere, the ribs would look cool. The last tattoo we have to show is super stylish. Here we have an arm tattoo that features peonies, a black stripe and half of a mandala. The combination of these designs is so trendy and it is perfect for someone who wants a tattoo that is different to the rest. You can recreate it with any mandala design. 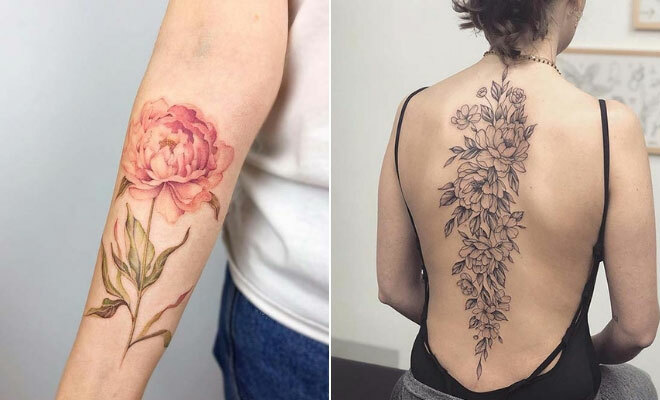 We hope you have been inspired by these beautiful peony tattoo ideas!